As part of the partnership between SUNY-ESF and RadTech International North America, a webinar on transitioning to UV LED printing has been scheduled for 2-3 p.m. Eastern on Tuesday, Oct. 2. The webinar, which is free, will be led by John Freismuth, Empire Screen Printing, and Jim Raymont, EIT. 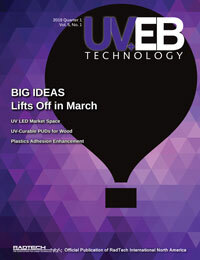 While UV LED technology has matured, many printers remain unaware of the changes that switching to UV LEDs will require in their press, their ink selection and their day-to-day processes and procedures. This webinar will examine the process of transitioning from traditional mercury-based UV light sources to UV LED technology. In particular, the speakers will identify and discuss those hands-on aspects of printing that are impacted by switching to LEDs, including process specification and quality control. A question and answer session will follow. Visit the registration page to sign up for the webinar. To learn more about UV/EB education and training opportunities, visit www.esf.edu/outreach/radcuring.